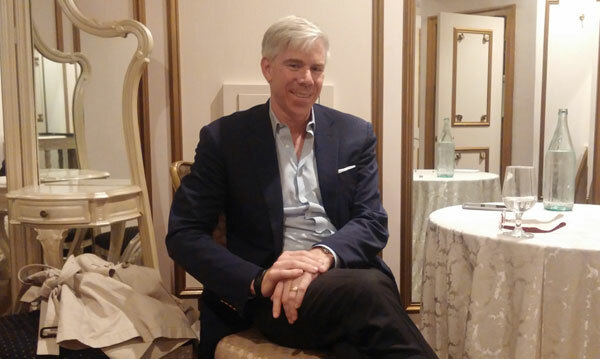 Broadcaster and political analyst David Gregory discussed politics and spiritual growth at the 2017 UJA Campaign’s Major Gifts event on Sept. 28. Shimon Peres’s example set a tone of inspiration for those gathered in Livingston on Sept 28, just hours after the Israeli statesman’s passing. Speaking at the annual Major Gifts event of the Jewish Federation of Greater MetroWest NJ at the Crystal Plaza, the federation’s executive vice president/CEO Dov Ben-Shimon and guest of honor David Gregory both cited the Israeli leader for his commitment to Jewish idealism. “It is even more incumbent on us now to continue his legacy,” Ben-Shimon told those gathered for the fund-raiser. 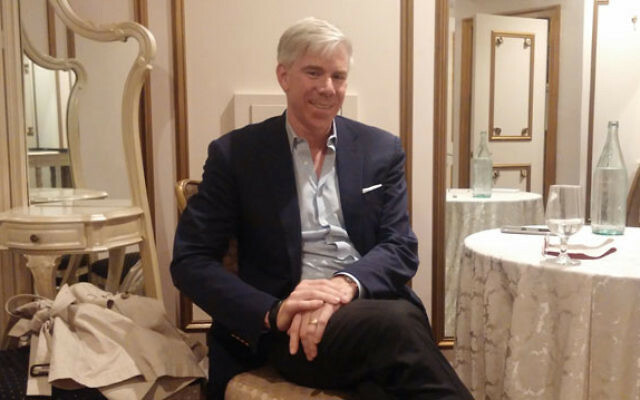 Gregory, the broadcast journalist and former moderator of NBC’s Meet the Press, cited Peres’s emphasis on Jewish values as a lodestar for his own exploration of identity. Peres, he said, saw spiritual priorities as “transcending affairs of state” and stressed that Israel’s identity as a Jewish state had to be based on morality. In discussion with this reporter, and later in front of the audience answering questions from Rachel Braun Scherl, Gregory discussed the current election season, and his search for spiritual wisdom as detailed in his book How’s Your Faith? An Unlikely Spiritual Journey. That title came from a question put to him by former President George W. Bush. Gregory expressed respect for Bush’s own moral striving, and — in very moderate terms — made clear his very different opinion of the current Republican presidential candidate. The GOP candidate’s supporters are unperturbed by his lies, Gregory added, “because they don’t believe him” in the first place. Just as Franklin Delano Roosevelt mastered the appeal of radio, John F. Kennedy shone on television, and Barack Obama used social networks, Trump is “a creature of this era,” a master of such current media outlets as Twitter and reality television. Including himself in this group, Gregory blamed the mainstream media for failing to foresee Trump’s appeal because they haven’t been close enough to the voters. Humility is something Gregory has explored extensively in the past few years. The son of a Catholic mother and a Jewish father, he didn’t begin to study Judaism until his Protestant wife questioned his beliefs. Gratitude for his professional success and marital happiness and a desire to provide spiritual leadership for his three children pushed him to explore how one becomes a better and more deserving human being. And then failure — his very public dismissal by NBC because of falling audience numbers — pushed him to seek “God at work inside of me.” The smaller he felt himself, he said, the greater his awareness of God. While spiritual exploration is more central to him than affiliation with Israel, he has developed a heightened appreciation for the importance of shared experience and community in Jewish survival. “The more spiritual I’ve become, the more ethnically Jewish I’ve become,” he said. The event, in support of the 2017 Greater MetroWest UJA Campaign, was chaired by Debbie and Allan Janoff and Ann and Mel Schaffer. In addition to honoring Peres, tribute was also paid to two of the community’s most revered philanthropists who died recently, Joseph Wilf and Norbert Gaelen. The crowd of around 310 major donors — those giving $10,000 or more to the federation’s annual campaign — was significantly larger than last year’s, according to organizers. “Using every metric imaginable,” said UJA Campaign chair Ira Steinberg the next day, the event “was a smashing success. We had the highest attendance in years, a large number of whom were young philanthropists under the age of 45. According to federation’s campaign director Rebecca Pollack, proceeds from the evening exceed $1.1 million.